In the original article, we explained the mechanics of Ryanair flight price changes. You could see that price go up and down and it is not always better to book too early. 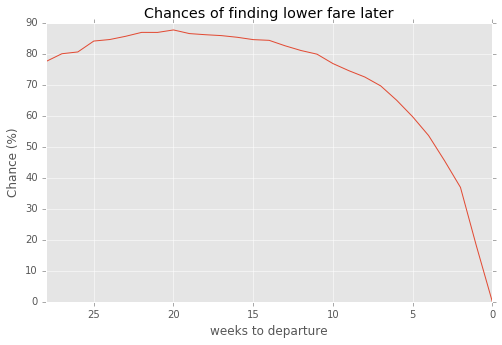 The following chart show the chances of finding a cheaper fare later depending on time to departure. The next chart shows the best period to find the cheapest Ryanair airfares (on average). 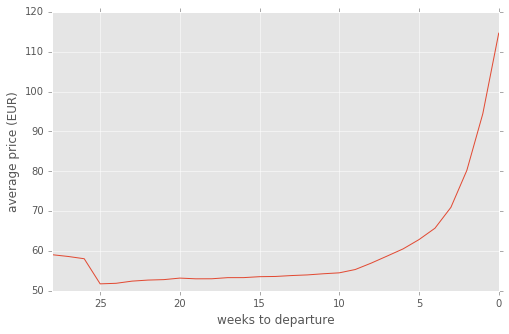 Besides time to departure there are many other factors which affect budget airline prices: seasonality, popularity of destinations, balance between offer and demand etc. It is extremely difficult for a customer to take all these factors into account when booking tickets. So usually travelers make booking decision emotionally. As researchers, we prefer to make data driven decisions and offer all travelers tools that might help beating smart airline price management algorithms. There are lots of smart analysts and powerful yield management system working on the airlines side. As travelers we need simple tools which can help us to save money by booking at the right moment. 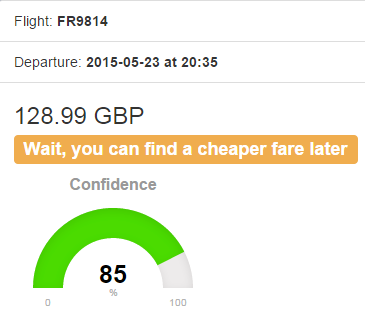 AirHint flight price predictor is the service which advises when to buy budget airline tickets. The idea is to help travelers find the best moment to book tickets. For a user it is clean and simple. You choose origin, destination and departure date. 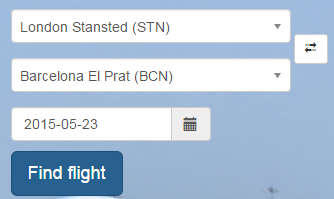 The tool finds the current price for the flight and analyzes it using historical data and our prediction model. As the result, you will get the recommendation whether to buy flight tickets now or wait more. Also it shows the confidence level, in other words how sure is algorithm about the provided recommendation. The accuracy of recommendations for Ryanair is approx. 80% and we keep improving it. So 4 out of 5 recommendations we make, are correct as later proved by historical data. With more users make queries in AirHint accuracy will improve even more over time. This is a crowd-sourcing effort to save money and time on your flight tickets. Behind the scenes, the algorithm uses historical data about price changes and processes it using its machine learning model, calibrated specially for a given airline. The model learns how prices of each airline changes and suggest the best time to buy your tickets in real time. Travelers can use these recommendations as another input when searching for cheap flight tickets. AirHint provides hints supported by numbers, which explain the logic of each fare prediction. You may find hints related to the time to departure, destinations, price statistics or other helpful tips related with the selected flight.